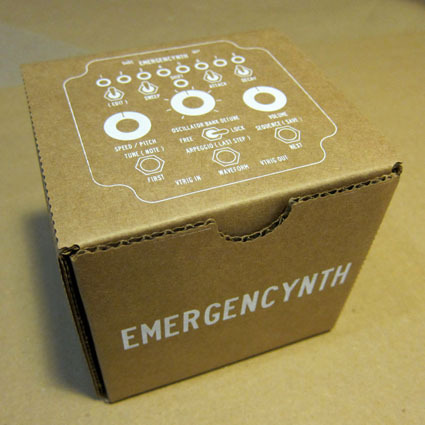 The EMERGENCYNTH is a portable synthesizer designed and hand assembled in Brooklyn, NY by screenprinter and musician, Karl LaRocca a.k.a. Kayrock. It has 8 oscillators which can be tuned in unison, spread out over a range of many octaves, or set to various preset harmonies. The oscillators can bet set to one of 4 different bandlimited: sin, triangles, saws and square. Switches control pitch sweep and 4 amplitude envelopes. The 32 step sequencer has programmable memory for 8 patterns. It comes with preset patterns written by members of Oneida, Trans Am, Parts and Labor, Roxy Pain and Knife Hyts, but you can save over them with your own creations. The Arpeggiator has 8 different modes, some standard, and some pretty weird like "one step forward, then two steps back", brownian walk and permutation. The Emergencynth comes housed in an electrical junction box, complete with power supply and a mini cable for connecting to other vintage gear. It sends and receives +5v gate trigger pulses and 1v/octave cv over a 5 octave range which are compatible with a wide range of vintage gear and midi to cv converters. 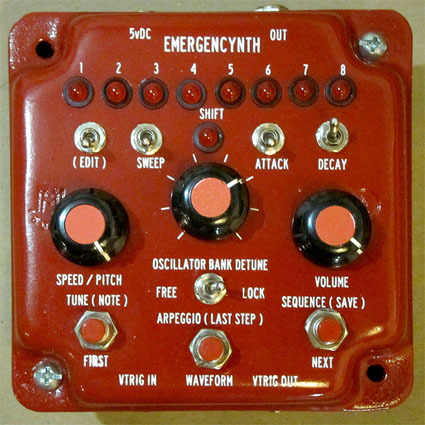 The Emergencynth is for sale at Main Drag Music, or order one now through paypal. Please email any questions to: kayrockscreenprinting@gmail.com.